Where is your @DavidArchie dream venue? Yes, yes, yes, I know David Archuleta isn’t touring anytime soon — especially not in this country 😦 — but a fan can dream, right? There are a few stages I would love to see David perform on someday (and really, any patch of floor will do, of course) but Toronto’s Massey Hall tops my list at the moment. Its rich history and amazing acoustics draw artists from around the world. Over the years, I’ve seen some of my favourite concerts there — from Aretha Franklin to Jackson Browne to Wynton Marsalis. And missed out on others that sold out quick (Adele, Jon Stewart). 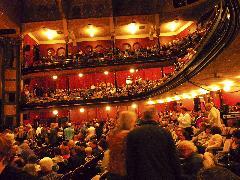 The 2,765-seat hall was a gift from the Massey family to the city of Toronto in 1894. Since then, it’s hosted classical, jazz, rock, folk and pop concerts, political rallies, chess tournaments, ballet performances, Dalai Lama talks, Bob Dylan and The Band’s first electric show, even boxing matches! My favourite story is that, in 1920, opera star Enrico Caruso not only set a new Massey Hall box office record of $70,000, he also went outside onto the fire escape to sing an aria to the crowd of people who couldn’t get in. Can’t you just see David doing the same thing? Why is it my top “dream venue” for David? It’s here in my hometown for one 🙂 . But more than that, it’s a magical place that somehow creates an intimate connection between artist and audience. I’ve felt it many times there and I’m pretty sure that’s why both performers and concertgoers love to keep going back. 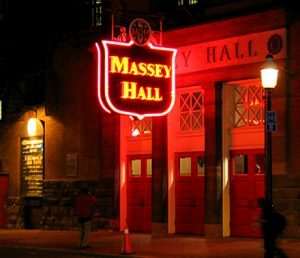 Massey Hall may be a little worn and creaky now and it isn’t about flashy sets, pyrotechnics or shiny lobbies … it’s all about the music … just like David. How about you guys? What special place would you love to see a David concert (your living room does not count 😯 ) and why? Or maybe he’s already performed at a venue close to your heart? Please share! P.S. Added a great interview with Dave Filice to the “must see” video sidebar (from the great Mindful of Music blog) … he mentions touring with David, how David has “music running through his veins” and his appreciation for all the fan support. This entry was posted in Utter nonsense and tagged David Archuleta, dream a little dream with me, Massey Hall. Bookmark the permalink. 37 Responses to Where is your @DavidArchie dream venue? Izabella, Hamilton Place would be awesome! (embarrassed to say I hadn’t heard of the Grand Olympia so i googled it … nice!!!) I remember just before Lady Gaga got huge, she toured southwestern Ontario (not Toronto, but small venues south & west) … would love it if David did that (‘cuz I know Toronto venues can be expensive places to book for tours). I would love one day to see David do a Christmas Show at Carnegie Hall in NYC. I hope a Canada concert is soon, TOfan. I did get to see a performance at Madison Square Garden in December 2008 at the Z100 Jingle Ball. MSG call themselves the “world’s most famous arena” with 19,500 seats and “has seen the biggest celebrities and brightest artists” pass through its doors. David performed a couple of songs between Kanye West and Chris Brown…loved seeing him come alive with Crush on stage that night and the company he performed with – Katy Perry, Rihanna, Leona Lewis, Jesse McCartney, Lady Gaga (before she was huge), Ne-Yo, Parramore and a couple others. Just watched the interview with D Felice….nice guy and talented musician. Love his words about fan support and David having ‘music running through his veins’….oh yes he does! Any musicians touring with David must have a unique experience….and the lounge area of the bus being filled with gifts, haha… a good visual. Nice post TOfan, always wondered where David would perform if he were to come to Vancouver. My absolute favorite venue here is the Orpheum. Beautiful little venue, seats about 2680 people. I have seen so many good artists perform there over the years and would love to see David there! It’s the home to the VSO and so many artists of all genres. Originally a great old movie theater that was meant to be demolished way back when but people rallied together to save it and it is now one of the most lovely, acoustically sound and perfect venues for performers. To see David perform there would be wonderful! Of course, any stage he were to bless with his presence and his voice would be fantastic. I’m familiar with Massey Hall and some of the performers who have set foot on that stage, Toronto has had some greats, sounds perfect for David. Love the story of Caruso! Would love to see David perform @ the Adler in Davenport,Iowa, the Mark in Moline,Ill. Definitely think Canada deserves a concert and think David knows that too! In a way he owes Minneapolis a concert due to cancellation last winter tour. I was scheduled for that and a storm cancelled my flight and the concert was cancelled because rodes were blocked. They were unable to reschedule that as it was almost the end of the tour. The IZOD Center in East Rutherford, NJ would be awesome. Lots of big acts come here… U2 performed a few weeks ago. Also, the new ‘Glee’ movie was shot here. Morrison Center in Boise, Idaho. If this is a dream venue list, I have to choose my city, although I tend to follow David wherever he goes whenever I can. He first performed in Boise in March of 2009, a fantastic concert, “one of those turning points,” he told me. And it was. Now he needs to come back to a venue worthy of his voice. The Morrison Center sits at the edge of the Boise State University campus next to the Boise River. It is an arts center best known for its acoustics. The venue has a capacity of 2037, and every seat is plush and comfy (selling point for me). On stage there—artists of all kinds, music of all genres, solo acts and groups of all sizes. “Wicked” was here this spring, with full staging. I also have a secret hope that my deserving Canadian fan friends will get their wish. It might even get me to eastern Canada: and Massey Hall sounds charming. I told him I did, and then he wanted to continue the conversation. Ack! I had not rehearsed that part. He kept talking and asking questions about Boise, and working the whole eye contact thing. I stopped stuttering long enough to respond with some embarrassing gibberish which shall not be revealed here, although it replays in my head at times like a recurring nightmare. I did manage to tell him it was a great concert and a lot of fun. He said Boise was one of his “best concert memories” and “one of those turning points.” I don’t know everything he meant by that, but he was sure on fire that night—new confidence, new moves, feeding off the crazy crowd. (I had been cross state at the concert in Idaho Falls the night before and saw the difference, as did others.) I always felt bad that there were not more clear videos of the Boise concert; but the camera police were out in full force. BTW, I have used the “I’m from Boise” intro with him a few times since. I always get an “I love Boise” back, but it still doesn’t help my conversational skills, lol. I would fly back there. Fond memorie of Motab and I stayed right across from Abravanel Hall. Oh yes, please! This sounds silly, but a concert at Woodland Park Zoo? Lawn chairs and snow leopards! In Seattle, the venue I’d dream of is our symphony hall, Benaroya Hall, which has magnificent acoustics. I don’t think a pop act has ever played there though. I should say the Fox Theater in Detroit. It is gorgeous, completely renovated, and all of the bigger acts perform there. I saw Anita Baker there. Loved her. But I won’t ever forget how David sounded while singing outdoors on a sunny day in August 09. His voice soared through the trees. Tofan, I hope the OS stalks this site and gathers up all the hopes and wishes. Keeping my fingers crossed for a Toronto or Buffalo stop just for you! Betsy, couldn’t agree more, would love for him to make it to Canada on his Christmas tour! You all are so deserving. My choice would have to be Red Rocks Amphitheater. It is an absolutely breathtaking amphitheater, the stage nestled amongst the red rocks in the foothills southwest of Denver, with the city lights in the distance. It has a capacity close to 10,000. It’s first documented performance was in 1906 and many of the top acts of the last 60 years have performed there, including the Beatles and The Grateful Dead. An awe-inspiring dawn Easter service is also held there every year. Here is a performance video – thought you might recognize the song. I loved Izabella’s first line! Amen to that! Love all the ideas listed1 I would actually not mind seeing David in a bluesy club in Toronto. There are so many of them…. GA would work for me. I would love to see him test out new stuff or covers, without alot of fanfare, fan signs, or VIPs to get hopes up for. More about the setlist and type of concert than the venue for me anyway. “I would actually not mind seeing David in a bluesy club in Toronto….would love to see him test out new stuff or covers, without alot of fanfare”…. been wanting to come to Canada, this could be the kicker. I do hope that David makes a stop or two in Canada this next tour. Y’all definitely deserve a show or more. Very loyal fans up there. This post made me start thinking about a post to my own blog from back in January when we were all hoping for a tour announcement. At that time I had written a plea for David to consider a tour stop here in Austin, Tx. I went back to that post and decided to revise that post today. 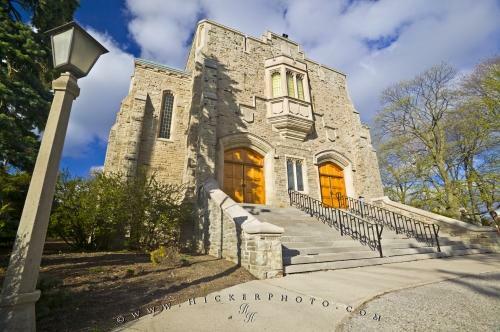 I have included photos from some of my favorite venues here. My husband is a live music photographer so I have shots from lots of the venues in Austin and some in San Antonio. My two favorite choices for an Austin concert would be The Backyard (an outdoor venue) or Austin City Limits – Live at the Moody Theater (a beautiful seated venue) . Both are new venues. Of course, we can’t have a concert at the Backyard under our weather changes and temps fall below 100 degrees. We’re on day 53 of over 100 as of today. You need to come visit sometime. Might be a good idea to wait until after we get some rain though. Not looking too pretty around here right now. Keiko just tweeted that David’s Japan performance has been rescheduled & he’ll perform at the Foster Festival in October (according to MCSS Okinawa Entertainment’s FB page) … will wait to see if it’s confirmed on the OS though! Yay for Japanese fans!!! Hope David gets to bring his sister, that would be cool for them. Loving all the venue ideas! …and how did I miss this bit of duet between David & Julie Ann San Jose on SBL, beautiful! Gorgeous, sweet videos! Love reading about everyone’s dream venues. Always good to dream, hope they all come true!